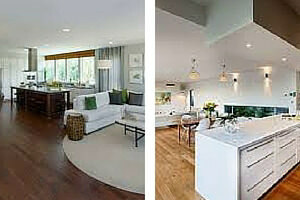 Open floor plans create a beautifully unstructured feel, but it is important to define your different living spaces. Here's how. Modern architects use open floor plans to create homes with seamless flow from one room into another, and to appeal to the homeowners' desire for multifunctionality. Large, open rooms create a spacious living environment, but unless you use clever interior design, you may end up with a home that feels unstructured and lacking personality. Use these tips to visually divide your floor plan into distinct rooms, without adding walls. Group Your Furniture: Group your furniture in close proximity to help the mind to automatically process pieces as a group, thus creating individual rooms. Use Colour: Clever use of style and colour can help define the different spaces on your floor plan. Do overlap styles ever so slightly to create a coherent flow that creates a homely feel. Use Angles: Most of us place our furniture in parallel lines, whereas placing one group at a 45 degree angle, rather than the 90 degrees or parallel angle. This small change can create an surprisingly unusual effect. Area Rugs: Instead of using small area rugs to define zones in your home, find large ones that cover most of the virtual space you are trying to create, with a border of flooring around it. Clever Lighting: Use a pendant light fixture over your sitting area to define the centre of the area. This will subconsciously define the size of the area. Don't want to get involved in construction? Use a retro overhead lamp. Ceiling Accents: While a dropped ceiling is a great way to accentuate an area, it also involves major construction. Instead, consider adding a simple bulkhead or beam to draw a line across the room and to create structure around your rooms. Furniture Dividers: Instead of putting up new walls, use heavy, solid furniture pieces to create an elegant visual divider between different areas and to stylishly complete your space while maintaining great circulation and floor space.